Helen Thomas is a respected journalist who served for 57 years as a correspondent and later, as White House bureau chief for United Press International. 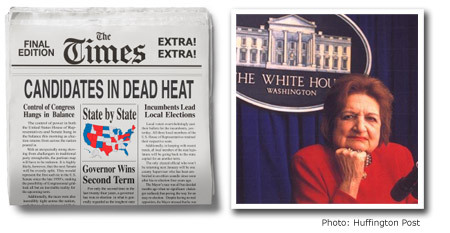 In 2000, Helen Thomas became a columnist at the Hearst News Service, where she still works. Read her latest columns here. She has written four books including Watchdogs of Democracy? : The Waning Washington Press Corps and How It Has Failed the Public. In 2007, she laid the blame on President Bush for launching the Iraq War as his “war of choice” and lamented that the “gutless-wonder Congress doesn’t have the courage to do what it needs to do” to end the war. In this frank discussion with Dr. Caldicott, Thomas recalls all the presidents she has covered from John F. Kennedy to George W. Bush, and talks about the current political climate in the United States. She conveys her admiration of Barack Obama and her fears about Sarah Palin, whom she describes as “to the right of McCain”. She spells out why the U.S. media have backed down from confronting the administration since September 11, and recounts the many times she has seen the world close to nuclear catastrophe. The last quarter of the show is an excerpt of Dr. Caldicott’s October 2008 presentation to Canadian medical professionals about nuclear power and the effects of global warming, in which she outlines how a “prescription for survival” for the planet must include following the downloadable report Carbon-Free and Nuclear-Free, A Roadmap for U.S. Energy Policy (2007). This entry was posted on Monday, October 20th, 2008 at 9:17 pm	and is filed under Uncategorized. You can follow any responses to this entry through the RSS 2.0 feed. Both comments and pings are currently closed.